Made in one pot and ready in under an hour, this One-Pot Goat Cheese Stuffed Chicken has everything you need for a healthy weeknight meal! There are about a thousand recipes for goat cheese stuffed chicken online and, quite frankly, I’m pretty sure any of them would work out just fine. I mean, any ingredient combined with goat cheese and stuffed into a chicken breast is going to taste good! However, I figured there had to be a way to take the classic baked chicken breast to the next level and turn it into a one-pot meal, so that’s exactly what I did. 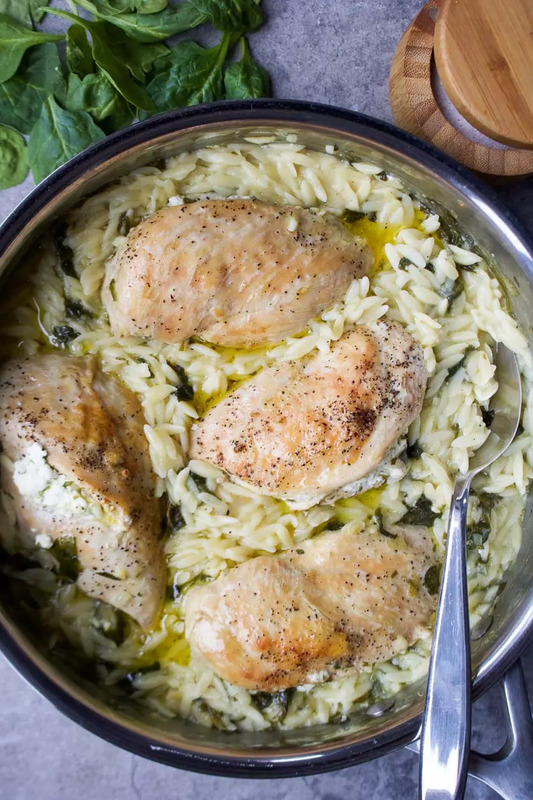 This oh-so-simple combination of goat cheese, chicken, spinach and orzo is quick and easy to pull together, while being incredibly delicious and nutritious! The recipe is simple enough that you probably already have all of the ingredients in your kitchen, but fancy enough that you could serve it at a dinner party and impress a crowd, so what’s not to love? 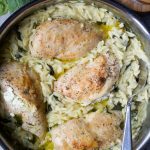 Complete with protein, leafy greens, and healthy fats, this One-Pot Goat Cheese Stuffed Chicken is a well-balanced meal that you can enjoy for dinner any night of the week! This Goat Cheese Stuffed Chicken is stuffed with a mixture of goat cheese and basil, however, feel free to use any combination of fresh herbs that you enjoy! In a small bowl, combine goat cheese and chopped basil and mash gently until well combined. Place the chicken breasts on a cutting board and slice each chicken breast horizontally, at it’s thickest point, about 1.5″ to 2″ long, keeping the ends attached, to form a pocket. Once a pocket has been formed, stuff each chicken breast with 1/4 of the goat cheese mixture. Once stuffed, season the chicken breasts generously on all sides with salt and pepper. Heat the olive oil in a large skillet or heavy bottom pan on medium-high heat. Once warm, transfer the stuffed chicken breasts to the pan and cook for 3-4 minutes per side until golden. Once cooked, gently remove the chicken breasts from the pan and set aside. Add orzo and spinach, stir to coat with the onion mixture, and allow to cook for about 1 minute until the spinach has wilted slightly. Cover with broth, stir until everything is well combined, and bring to boil. Once boiling, reduce to a simmer, and return the chicken breasts to the pan, gently submerging them half-way in the broth . Transfer the pan to the oven and allow to bake for a 20-25 minutes until all of the broth has been absorbed. Remove form the oven, fluff orzo with a fork and allow to cool slightly before serving.